The first out-of-town trip that I joined with my officemates that isn’t company-sponsored was at Treasures of Bolinao in Bolinao, Pangasinan. This is a remote beach resort at Patar Beach, Cape Bolinao on the western edge of the province and overlooks the vast expanse of the South China Sea. The trip was way back in summer of 2004 and I would have to say that the 6-hour (one way) trip going to and from the resort was a bit stressful, though there were plenty of memorable sights and events along the way. Like the time when one van in the convoy was overtaken by a tricycle, or spotting a jeepney with a “Hog Dealer” signage but filled with people, and using a shop sign that says “Liposuction, breast augmentation, and nose lift” as a landmark. Treasures of Bolinao was actually just starting as a resort when we went there. It actually felt like we were guests of a family vacation house complete with lutong-bahay (home-cooked) meals. The accommodations were sparse and there was no swimming pool yet. The place is actually so remote that the road going there from the town proper of Bolinao was not well-paved and is actually no more than a dirt road in some places. Plus, there was no cellphone signal at all in the area at that time. However, the location was quite nice. The resort is built on top of a rocky part of the beach and the concrete bridge over the rocks (seen quite clearly in Google Maps) is one of the unique highlights of the resort. There’s a small beach to the north, and a lengthy stretch of off-white sand to the south, but what I enjoyed most was walking along the rocks during low tide and plunging into jacuzzi-like pools scattered among the rocks filled with small fishes. 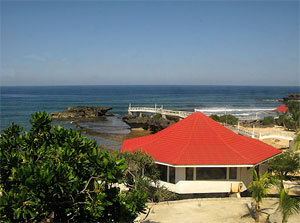 Photo from the Treasures of Bolinao website. Unfortunately, we weren’t able to go to the famed Cape Bolinao Lighthouse nearby, which is supposedly the second-tallest lighthouse in the country next to Cape Bojeador Lighthouse in Ilocos Norte. (I’ll try to feature the Bolinao lighthouse in the future. Now featured!) The tourist spot that we were able to go to is the so-called Cindy’s Cave which has a nice natural underwater pool. I haven’t gone back to Treasures of Bolinao but the amenities and infrastructure in the area is definitely loads better. Bolinao as a travel destination is entering the radar of local travelers and demand is picking up. One boost to the tourism of the resort and the area was the fact that several scenes in the movie Agent X44, which starred Vhong Navarro, was filmed at the resort. (The movie sucked, by the way.) And basing on what I saw in the movie and the photo gallery of the resort’s website, I wish we went to Bolinao a few years later instead. wassup Eugene, great meeting you this saturday.. continue to do big things with your blog… ill see you at the next event. @Mica, punta ka ulit, at i-blog mo! I want to explore Pangasinan as well. We all love your blog here in Bolinao Pangsinan. This site is dedicated to all my kababayans in Bolinao. Abao a Salamat! Hi everyone, ang ganda talaga ang napuntahan ng group. We visited the western Pangasinan and its beautiful. People are kind and ready to accept tourism. We went to Alaminos the hundred island and hop from island to island. The most popular is Quezon island. We then drove further west the end of Pangsinan, its Bolinao. Marimi din dito ang magagandang beach resort. We visited couple of beach resorts upto the light house. We noticed there is a hidden resort by Patar beach. It look familiar to us, but we have not been here before. It is so beautiful, well manicured resort. Treasurs of bolinao its name. It has a bridge by the sea and rooms got a ocean view. This resort is one of a kind. One of the most exotic I’ve ever seen. THE LOCATION, THE BEST. Treasures of Bolinao is the most beautiful resort we’ve ever been in the Philippines. We had a reunion at the resort and the service is outstanding; very accommodating. The beach is so virginlike, lots of fishes. Behind the resort is the century old light house. Hi everyone! Is anyone out there not too sure where to spend their holy week within easy reach, try to surf the net and you’ll find many beautiful places such as Bolinao. One in particular is Treasures of Bolinao. A truly tranquil resort a sort of place where things passes by with quietness and beauty nortured by natures. How I wish we have more time at treasures. Maganda, Malinis, Mababait sila. Well done treasures hope to see this place again soon. Treasures of Bolinao Resort in Bolinao Pangasinan is not a recommended place to stay. Honestly i experience it foods and services are way low quality…I hope department of Tourism can check this out. Hi check this out youtube.com jakeanywhere. Some people don’t have the right mode and perhaps perception when they go to a seaside resort such as Treasures. A group of guests were questioning about the rate. They seems trying hard to fit with a so called with class. But regretably, not even a shadow can fool a true person with class in believing this sort of guests. They are a nuisance. They keep complaining of almost anything. Just for the sake to get attention. Our group tried to kept distance with this bad guests. They are infectious and can ruin good mode. Its a relief, they only stay for a day. But I can say, our group found happiness at Treasures. They have very accommodating staff, food is alright, clean room and reasonable rate. I have noticed that some beach goers in particular younger ones tend to disregard the mother nature. Don’t litter our beautiful beaches. Take your litter with you. The mother nature loan this beautiful place not for us but for future generations. Thank you. Hope I made my point. Treasures of bolinao, keep it up. Don’t bother those baseless and unconstractive comments. As far as we are concern, Treasures is a true treasure. poor service. the owner and receptionist have very bad PR skills. they were also very unapologetic and disrespectful. the place is full of flies. we ate with the flies!aggh. they gave us extra beds coz we shared rooms, but we had to ASK for the clorox-soaked bedsheets and pillows.they don’t honor their word, much more their clients. and they charge way too much. Pretty place, horrible people. The long trip to the resort was not worth it. The service was poor, the owner was very unfriendly. we booked a suite room but there was NO WATER. They said they were just fixing the pipes but we were there for 3 hours already and the pipes were not yet fixed. They transferred us to a different building, smaller room but they still charged us the same rate! !